SHAH DENTAL CLINIC is located in the prime area of Jamnagar City – Hospital Road, Opp. District & Session Judge’s Bungalow, City Arcade on First Floor. The clinic fulfils all basic criteria of modernization, i.e., all apparatuses are imported from Germany and Brazil, 90 % radiation flaring free x-ray machine, eco-friendly environment & professionally skilled & courteous staff. It has facility of Lift for age old and handicapped patients. It offers international quality dental care with an aim to maintain thoroughly sterilized infection free working atmosphere. 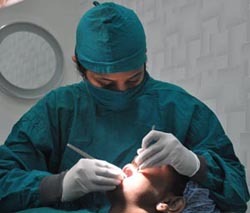 Shah Dental Clinic has gained immense popularity not only in Jamnagar but all over the state due to its world class infrastructure, equipments, efficient doctor, strict emphasis on asepsis and sterilization. From common dental problems such as painful teeth, sensitive teeth, bad breath, bleeding / swollen gums, loss of / missing teeth, discolored teeth to disimpaction and dental cysts. Shah Dental Clinic is your one stop shop for dental treatments in Jamnagar, India. Visit us to experience the best dental care to bring new dimension to your teeth. Sterilization and maintenance of hygiene is our prime concern. Instruments are cleaned and packed in pouches and then autoclaved, which maintains the sterilization till the time of use. Our mission is to make your visit at our centre comfortable & satisfying experience. We will be glad to hear from you if you have any questions.